Dentistry and Pharmaceutical Sciences, Okayama, Japan. Received November 11th, 2010; revised January 10th, 2011; accepted March 1st, 2011. Okayama might be accelerated more rapidly than that in Tokyo area in recent 50 years. have, remain to be investigated. various areas from the viewpoint of the heat island effects. residential and/or commercial areas (Figure 1). 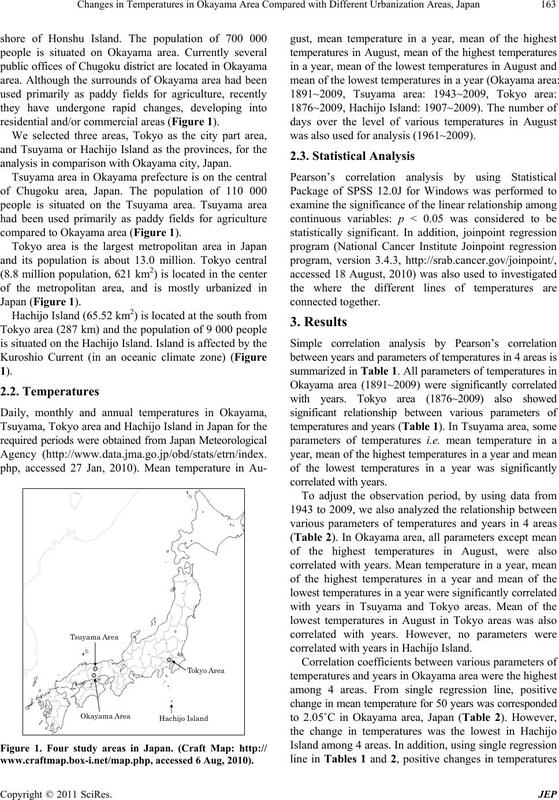 analysis in comparison with Okayama city, Japan. compared to Okayama area (Figure 1). www.craftmap.box-i.net/map.php, accessed 6 Aug, 2010). was also used for analysis (1961~2009). 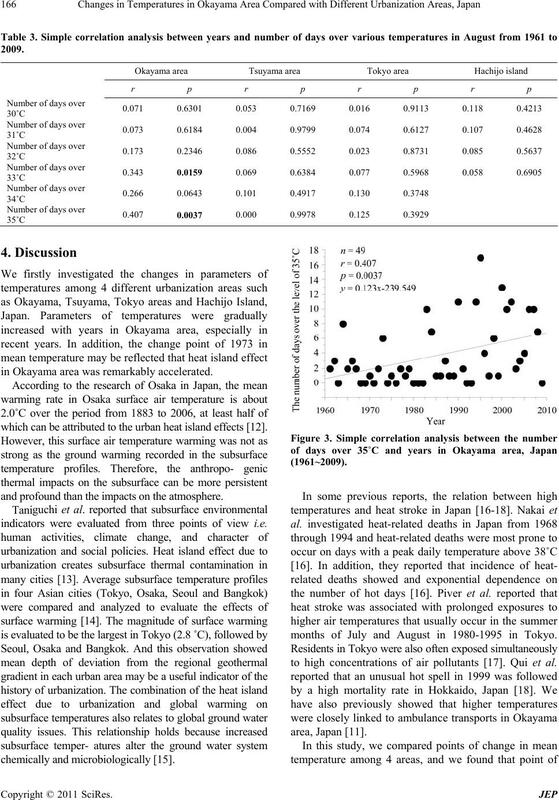 correlated with years in Hachijo Island. Okayama area was significantly correlated with years. highest (r = 0.407, p = 0.0037) (Fi gure 3). Table 1. Simple correlation analysis between years and paramete r s of temperature in four areas. Table 2. 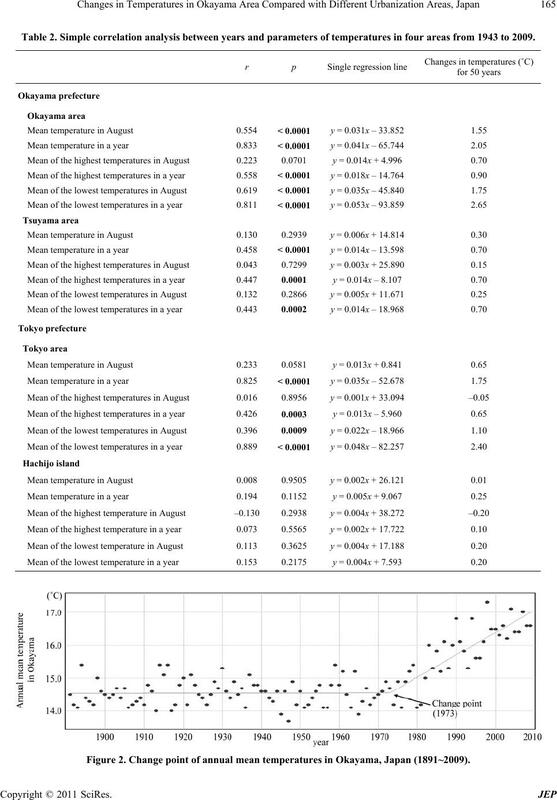 Simple correlation analysis between years and parameters of temperatures in four areas from 1943 to 2009. Figure 2. 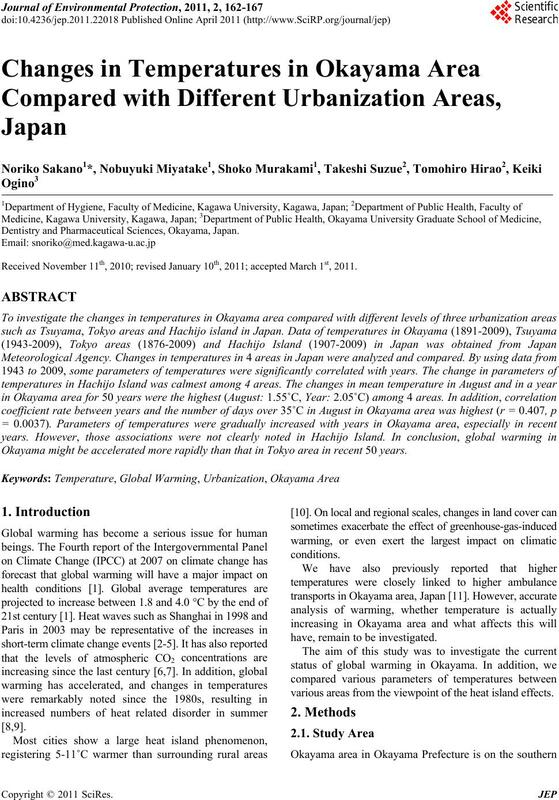 Change point of annual mean temperatures in Okayama, Japan (1891~2009). in Okayama area was remarkably accelerated. which can be attributed to the urban heat island effects . and profound than the impacts on the atmosphere. months of July and August in 1980-1995 in Tokyo. to high concentrations of air pollutants . Qui et al. indicators were evaluated from three points of view i.e. 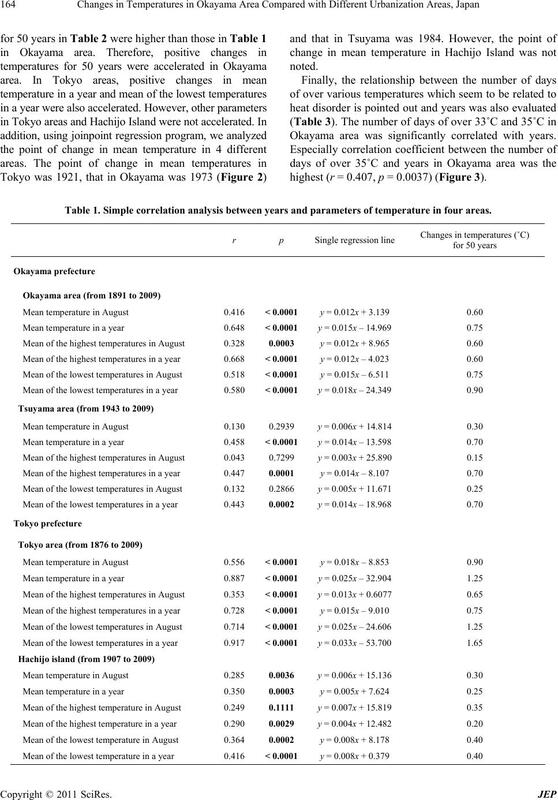 Okayama was 1973 and that in Tsuyama was in 1984.
dealing with heat island effect in Okayama area i.e. be good parameter of urbanization in Japan. 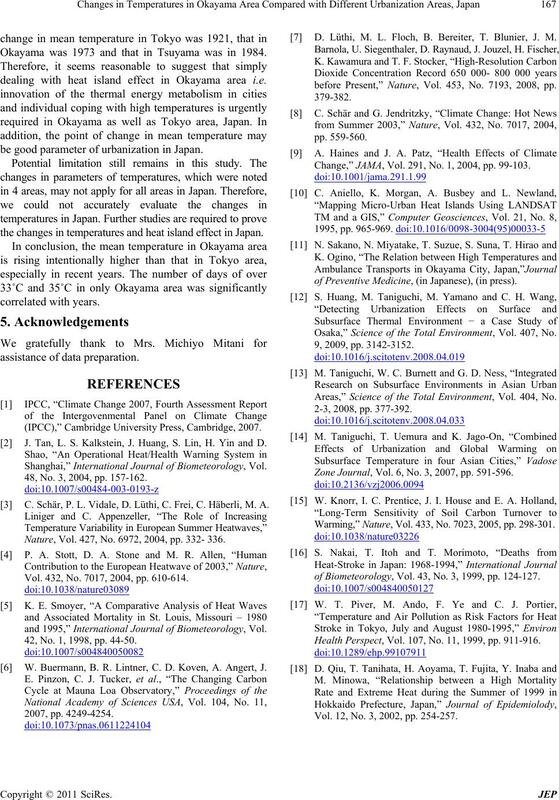 the changes in temperatures and heat island effect in Japan. (IPCC),” Cambridge University Press, Cambridge, 2007. J. Tan, L. S. Kalkstein, J. Huang, S. Lin, H. Yin and D.
Shanghai,” International Journal of Biometeorology, Vol. 48, No. 3, 2004, pp. 157-162. C. Schär, P. L. Vidale, D. Lüthi, C. Frei, C. Häberli, M. A. Nature, Vol. 427, No. 6972, 2004, pp. 332- 336. Vol. 432, No. 7017, 2004, pp. 610-614.
and 1995,” International Journal of Biometeorology, Vol. 42, No. 1, 1998, pp. 44-50. W. Buermann, B. R. Lintner, C. D. Koven, A. Angert, J.
 D. Lüthi, M. L. Floch, B. Bereiter, T. Blunier, J. M.
before Present,” Nature, Vol. 453, No. 7193, 2008, pp. Change,” JAMA, Vol. 291, No. 1, 2004, pp. 99-103.
of Preventive Medicine, (in Japanese), (in press). Osaka,” Science of the Total Environment, Vol. 407, No. Areas,” Science of the Total Environment, Vol. 404, No. Zone Journal, Vol. 6, No. 3, 2007, pp. 591-596. Warming,” Nature, Vol. 433, No. 7023, 2005, pp. 298-301.
of Biometeorology, Vol. 43, No. 3, 1999, pp. 124-127. Health Perspect, Vol. 107, No. 11, 1999, pp. 911-916. Vol. 12, No. 3, 2002, pp. 254-257.